The markets ended lower for the fifth straight session as the index heavyweights like ITC, L&T dragged the benchmarking indices amid weak corporate earnings for the second quarter. Mumbai: The markets ended lower for the fifth straight session as the index heavyweights like ITC, L&T dragged the benchmarking indices amid weak corporate earnings for the second quarter. Experts point to the investor to exit from those stocks disappointed on the quarterly numbers as the investors believe that the market conditions will not change considerably till the first quarter FY17. 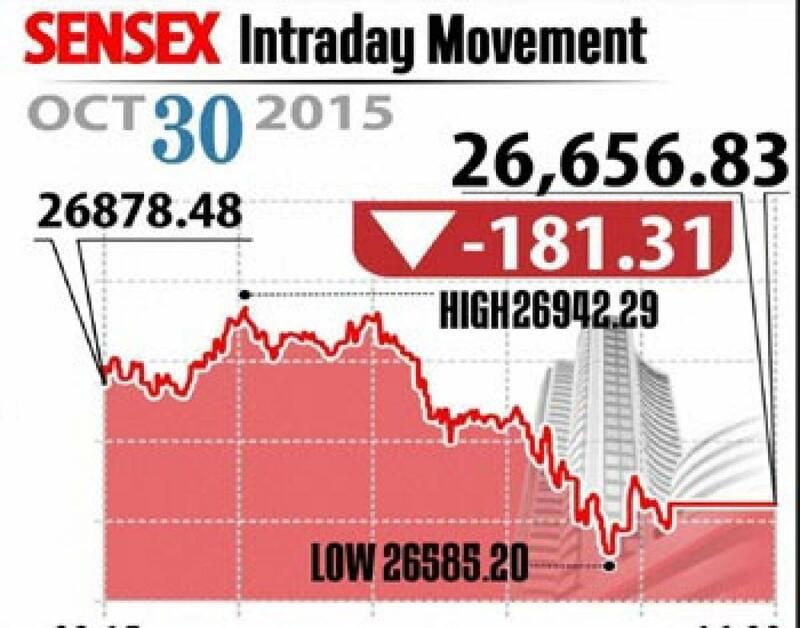 Sensex ended down 181 points at 26,657 and Nifty closed lower 46 points at 8,066. Meanwhile, the broader markets also closed down with midcap declined to 0.1 per cent and smallcap lower 0.8 per cent. On the sectoral front, the capital goods index was top loser to 2.7 per cent while FMCG index down 2.3 per cent and other sectors have followed, except healthcare, consumer durables and bankex indices reports smart gains. FMCG major ITC share ended down by 4 per cent as the company reported flat profits for the September quarter, also L&T share end 4 per cent lower. On the other hand, NTPC shares closed up 3.3 per cent as the company posted 40 per cent raise in its net profit. From pharma pack, Dr Reddy's ended up 1.3 per cent as the company beat analysts estimate, while Cipla closed lower after the company decided to sell its Biomab Holding, a biosimilar drug maker. Also Glenmark Pharma closed 5 per cent up as it obtained USFDA nod for its Locasamide tablets. Markets cheered to the proposed civil aviation draft policy by government with Jet Airways and SpaceJet closed gaining 8.5 to 9.5 per cent each. The gainers: NTPC, up 3.83 per cent by Rs 132.70; ICICI Bank, up 2.04 per cent by Rs 277; Dr Reddy's, up 1.32 per cent at Rs 4,269.50; and Axis Bank, up 1.18 per cent at Rs 474.95. The losers: Vedanta, down 6.41 per cent at Rs 100; ITC, down 4.30 per cent at Rs 334.70; L&T, down 4.11 per cent at Rs 1,411.15; and Mahindra & Mahindra, down 3.72 per cent at Rs 1,182.50.